If you keep in mind that Izoro is more of a destination of the mind than an actual physical destination you are likely to have a fine time getting there. Izoro is on Farm Road 1690, about 18 miles northeast of the city of Lampasas, five miles east of the Lampasas River and a little more than three miles from Franklin Mountain, which rises 250 feet over Bear Branch and qualifies as a mountain because of its general Grand Prairie setting. Though about all that's in Izoro now is an old gas station pulling duty as a post office, it's not hard to see why people settled here. There's the mountain, the creeks running to the Lampasas and a nice view of the surrounding land. The pleasant setting belies a bloody past. Originally called Higgins Gap after early settler John Higgins, Izoro was, according to historical reports, subject to Indian raids and feuds among the settlers. A former postmistress, Ethel Upton, lives on in Izoro lore as a crack shot. Her marksmanship was said to be something of a tourist draw back in the day. Snakes were a favorite target, but she could bring down birds too, including hawks if they were stupid enough to circle over her chickens. No one complained about their mail delivery while Ethel Upton was postmistress. Losharris Murrah Cunningham, Upton's niece, grew up in Izoro. Her father was postmaster there in the 1950s. She says Ethel Upton was born in about 1907 and lived to the ripe old age of 93. She said too that her aunt's marksmanship sometimes had some unintended consequences. "One night, shortly after purchasing a new shotgun, she shot the head off her prized exotic Prince Feather flower because she said it looked exactly like a man's head bobbing sideways and up and down, and would not go away even after being warned by a notorious marksman like Mrs. Upton. "She was really displeased with herself when she saw what she had done, and a little embarrased that she had istaken the flower for an evil person," Mrs. Cunningham said. Ethel Upton was the oldest of 10 children, six of them girls, and every one of the girls was a crack shot, Mrs. Cunningham said. Izoro sprang up along a wagon road that ran between present-day Pearl and Townsen's Mill. For a short while, Izoro was something of a boom town, growing from a population of 25 in 1925 to 150 in 1927. The town may have taken a toll on young lovers and snakes, but the boll weevil found a home in the area's cottonfields in the 1930s. By 1933, the population of Izoro had dwindled back to 25, but the boll weevil population boomed. In its heyday, Izoro also boasted a dentist. "At least there was a fellow who pulled teeth. Roy Chambers said in the book "Lampasas Lamplights." "He built a little shack, put a couple of bottles of pills, a bottle of quinine and a pair of pliars on the shelf, set a stool in the middle of the floor and went into the dentist business." Today, getting to Izoro is half the fun; it might even be all the fun. If you take FM 1113 out of Copperas Cove to FM 580 and make a left at Topsey you will pass FM 118 on your right. That road leads to the Topsey Exotic Ranch, which has more than 50 kinds of wildlife, including adax, scitmar horn oryx, fallow deer, sika deer along with native critters like longhorn cattle and bison. There are also a couple of tigers and a mountain lion. From there you can turn north on County Road 3460 or stay on 580 through Rumley to get to Izoro. Along the way you come upon a series of unexpected vistas and valleys, including one of the panoramic variety just past Falls Creek Ranch. Just going this far west you notice a difference, as West Texas begins to show its geology and some of its flora and fauna. This is ranching country and you pass ranches with names like Crow Ranch and Copperhead Ranch. You may not notice it, unless you're on a bicycle, but the land rises the whole way. Cross the Lampasas River and take FM 2527. Then veer right on FM 1690 and pass a gorgeous view of the Lampasas about five miles from Izoro. There's not much left of Izoro now. 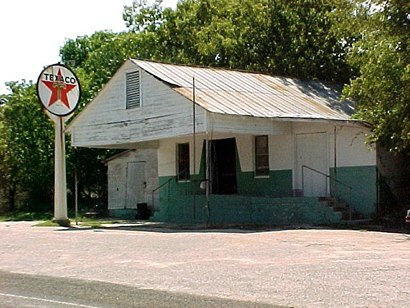 Coming in on FM 1690 you pass first a vacant building that once served as the community center. The old gas station is right around the first bend. So is the rest of the world. Drive though that bend in the road and you're out of Izoro, but it's not supposed to matter. If you find the town you were either looking for it or you're lost. Once you're in Izoro, you have a couple of choices. One is to keep going. The other is turn around and drive back to Cove. It's not such a bad option because driving out of Izoro is just as pleasant as drive there.